Wire is something I really love working with. It's a passionate part of my jewelry marking, whether it be chaimaille and jumprings, or wrapping beads with it, or making charms or clasps, or weaving it around a wood dowel (viking knit). Viking Knitting has to be one of my all time favorites. This advanced class is taught at Nomadic Notions. Taught again by Mick Mcnulty (sweet!). 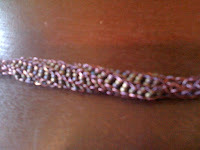 Learned how to incorporate beads into the weave (beads directly on the wire) the first night. The second night we learned about twisting and adding bead embellishment to the outside of the completed viking knit as well as inserting beads inside the viking knit tubes. I didn't personally care much for the beads on the outside thing so I just knitted during that portion of class. I did do direct bead on the wire advanced knitting and also tried inserting beads into the tube (I used gold stone which looks really cool used this way...I got the idea from another student in glass who did it). My favorite is the twisted sterling silver, although I didn't make enough of it, so I was pretty bummed that it's short. I'm going to have to make a section of chainmaille extension to finish this off. I did this with another piece too, but that is being featured in the my blog post for Rita Marie Ross's Soldering Workshop. 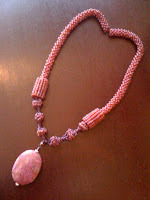 The ones below are the ones I did with seed beads added directly to the wire. The solid one I just did a small section but I'm planning to make a full necklace of this since I really like it. 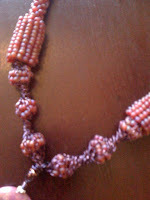 The other one was done with sections of bead on wire that were then twisted into these little berry-like thingies. It's definitely one of my more unusual pieces. Thanks to Rita Ross for the idea of adding this pendant!